NASA astronaut Greg Chamitoff, STS-134 mission specialist, participates in a spacesuit fit check in the Space Station Airlock Test Article (SSATA) in the Crew Systems Laboratory at NASA's Johnson Space Center while training for the final mission aboard Endeavour.NASA astronaut Andrew Feustel, mission specialist, assisted Chamitoff. This story was updated at 3:15 a.m. EDT. HOUSTON — Two astronauts have ventured outside the International Space Station Friday (May 20) to begin the first of four tricky spacewalks planned for their mission to the orbiting lab. Endeavour shuttle astronauts Drew Feustel and Greg Chamitoff donned spacesuits and floated outside the International Space Station to begin a roughly 6 1/2 hour excursion. The spacewalk officially began at 3:10 a.m. EDT (0710 GMT). "It's a dream come true for me," said Chamitoff, who is making his first spacewalk. "Welcome to space, buddy," said Feustel, who already has three spacewalks under his belt. The four spacewalks planned for Endeavour's STS-134 mission will be the last spacewalks ever carried out by a space shuttle crew, because NASA's final shuttle mission — the July STS-135 flight of Atlantis — has no spacewalks scheduled. The shuttle mission has been going smoothly so far, with astronauts installing the shuttle's two main payloads — a $2 billion astrophysics experiment and a platform of spare supplies — on the space station without incident. This NASA graphic released May 19, 2011 shows the location of damaged tiles on the belly of space shuttle Endeavour caused by debris during its May 16 launch into orbit. However, mission managers are still investigating two spots of damage on Endeavour's heat shield tiles during launch. Most likely, these damaged areas will pose no risk to the orbiter during re-entry to Earth, but more investigation is needed to be sure. NASA is considering adding another inspection of the heat shield to the astronaut's schedule to allow better photos of the areas to be taken. 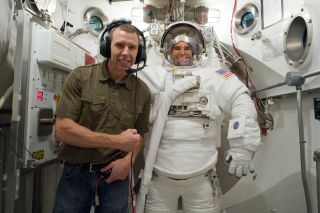 While Feustel has performed three spacewalks before during the Hubble Space Telescope shuttle servicing mission in 2009, this is Chamitoff's first time working outside a spacecraft. "I have a couple minutes to do that, make sure I don’t go flinging myself off the station ’cause I’ve pushed too hard," Chamitoff said in a preflight NASA interview. Then the spacewalkers will get to work. Their main task is to retrieve samples from a science experiment called MISSE (Materials International Space Station Experiment), which tests the reaction of different materials to space. "The idea is to expose these things to the harsh environment of space for a long period and see what happens," Chamitoff said. "If the seeds will still germinate, if a paint material will protect what’s below it, see if a circuit can still work and to help us design better systems for the future." Chamitoff and Feustel will gather the materials that have been out there, and bring them back inside the so they can be carried down to Earth on the shuttle for analysis. Then they will replace these samples with new materials for another round of testing that will last between six months to a year. After that, the spacewalkers will do some work to prepare for an activity during the mission's second spacewalk, when Feustel and mission specialist Mike Fincke will top of ammonia coolant in a system that has a small leak. Chamitoff and Feustel's job during the first spacewalk will be to install a jumper cable and vent some nitrogen from the system. Finally, the spacewalkers will install new antennas for a wireless communication system. Overall, their activities will take Feustel and Chamitoff up and down the football-field length of the International Space Station. "We'll be traversing from end to the other of the space station that'll be new for me because on the Hubble mission we lived in the back of the payload bay and Hubble wasn’t very far and on the space station mission you get a lot of mileage out of the suit," Feustel said in a preflight interview. Meanwhile, from inside the space station, mission specialist Mike Fincke will help choreograph the spacewalk maneuvers. "Although this won't be among the most complex spacewalks NASA's ever carried out, "any time you put the crew in a spacesuit and send them out there, there's risk involved," lead station flight director Derek Hassman told reporters Thursday. Overall, though, he said the spacewalk's tasks were relatively straightforward. The other three Endeavour astronauts will spend the day transferring supplies from their shuttle to the station.